Hello, hello, hello everyone!! Welcome to Moosehead Stew! What exactly is Moosehead Stew? 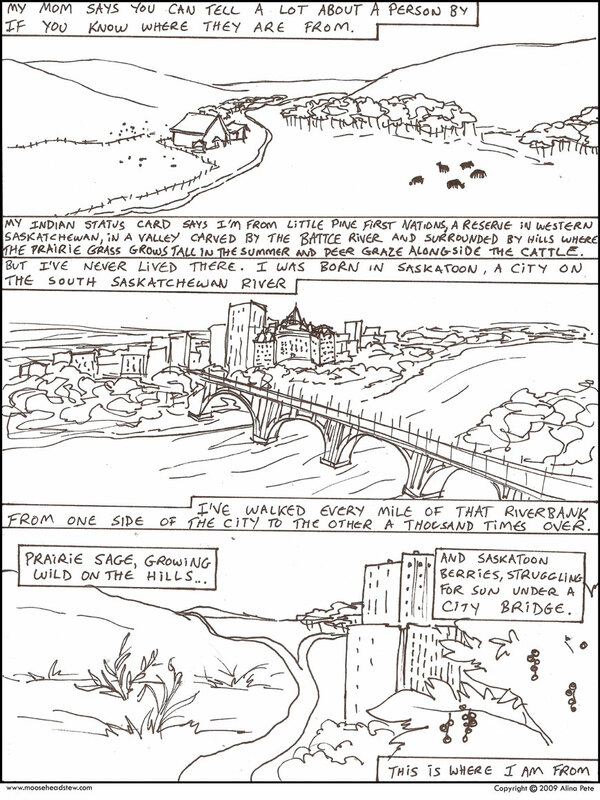 Well, aside from being a *traditional plains way of preparing moose, it’s also a journal comic about me, a Cree girl from Saskatchewan. Many of you probably know me from my other comic, Weregeek, and you can still expect a healthy serving of geek humor here at Moosehead Stew, since my life is pretty geeky. But you can also expect to see other stuff, like glimpses of my past, my family & friends, and my travels. Enjoy a rich stew of moments, ideas and observations from my everyday life, with just a pinch of randomness thrown in for seasoning. I hope you enjoy it! 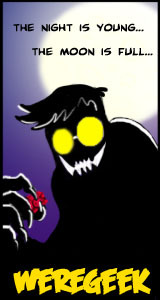 Moosehead Stew will update Monday, Wednesday and Friday for now, but I hope to see how things go balancing this with my other comic, Weregeek. If all goes well, I hope to have Moosehead Stew run 5 days a week! If you like what you’ve seen so far, please show your support by heading on over to the forum and saying hi! *Usually made with just the moose nose, as it is considered a delicacy, but moosehead sounded better. Looking forward to the new strip, and I love the logo! Nice initiative it seems like a good concept but i hope you don’t exhaust yourself. Congratulations on the launch of your new strip! (It’s sort of a blog, isn’t it? There’s photo-blogs and video-blogs. Podcasts can be audio-blogs. What would you call a blog published in serial art form? Comic-strip-blog? Sounds a bit clunky. Anyway…) I’ve enjoyed Weregeek for some time and I wish you continued success with it and equal success with this, your new project! Okay, I’m interested now. 🙂 I’m a Weregeek fan, like I’m sure most people here are. I hope this new comic serves whatever purpose you need it to. Okay, selfishness over, I look forward to what may come. Surf wisely! Yay new comic! I love the logo. The art is very free form, almost messy, but it has all sorts of little details in it. Guest Spots?? sweet i want one two…. I r can has moosehead? Is it me or is the RSS acting Funny? As a fellow geek, I must ask; since you’re a Cree, do you hate Skrulls? (LOLZ) But seriously, good luck on the new comic! I wish you every success! No seriously, it is. My fiance is Mi’kmaq so knowing that there’s a native comic artist/geek/gamer-gal is pretty neat. Saskatooooooon! The river is where it’s at! Can’t wait for more. A webcomic-slash-blog. Intriguing, sez I!